In keeping with the theme of yesterday's post ( well kinda…) thought I would share this article re: the don'ts of salad making. I must admit I have been guilty of #5 on occasion, especially when there was an especially good homemade dressing available. Incorporate at least one new ingredient, that you haven't tried in salads before, every time you make a salad. Some of my favs….. sunflower seeds, dried cranberries, leftover cold chili, a sprinkle of poppy seeds, rye bread croutons…..whatever's available and seems to be a good 'fit' for the particular salad you are making. Try to add a protein source to make the salad more of a meal and not just 'rabbit food'. One of the complaints people often make about a salad main course is that they are starving a couple of hours later. Not the case if you add a bit of protein to the mix. Some of my choices…crumbled feta cheese (go easy on this, very salty and rich, a little goes a long way). strips of veggie ham or smoked turkey (great way to make a chef's salad), nuts, seeds, cold cooked lentils, beans, marinated, baked tofu chunks…. Take the time to make homemade dressings. So much better and if made in smaller quantities not a problem to use up before it's past prime (another common complaint and excuse for buying store -bought). Yes, there are some good commercial dressings available but these are often very expensive and still don't compare with fresh and homemade. Needless to say, the cheaper, regular brands can be chemical nightmares, more label reading! If you've got a blender or food processor the whole process takes only minutes. Even though you should be buying (or picking) fresh salad greens just before use, there's no reason why you can't have many of the add-ons on hand. Dressing ingredients, beans, grains, pasta, dried fruits, nuts etc…can be ready and waiting to add to the mix. 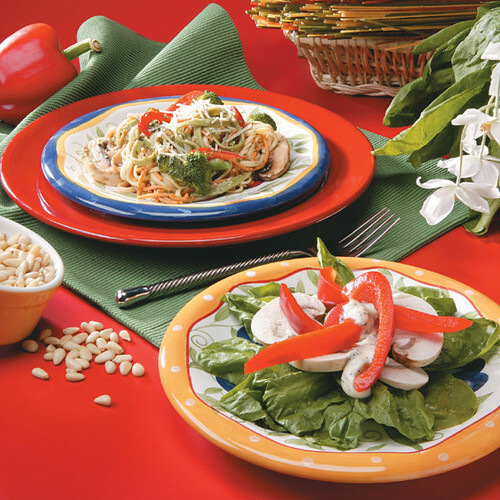 This is an elegant and colorful addition to any meal or serve as a main course for a delicious light supper. Serves 4 as a main course and 6 as side salad. Prepare vegetables and layer in order given, on individual serving plates or bowls. Just before serving, drizzle each serving with Creamy Poppyseed- Mustard Dressing (see below). Whisk together all ingredients. Allow to chill to blend flavors. Drizzle over salad, just before serving. PS Also shown in photo: Pasta Primavera with Fresh Pesto Sauce (I will share that recipe another day). Reprinted from: Not Just for Vegetarians, Delicious Homestyle Cooking, the Meatless Way by Geraldine Hartman. Photo: Patricia Holdsworth Photography. All rights reserved. Thanks for the salad tips and recipe! I just posted about Red Quinoa after you commented. I also replied to your comments there, too! Spinach, cherry tomatoes, avocados, and THINLY sliced fried tofu (so it’ crunchy) yum yum. have a goo day G! Those salads look delicious. Homemade salad dressings taste so much better than the store bought varieties. Good Morning Salad Lovers….Thanks for the tips Harmonia, and the heads-up re: the Daily Om. Teddy…take it easy on the ‘naked’ salads, put some dressing on, has your salad no shame LOL and have a goo day too :). Vegan Momma, thanks for stopping by too, yes, homemade is always better. I’ve never tried making my own dressing before, guess there’s always a first. *embarrassed* I’m guilty of all 5 dont’s. I’m working on being better LOL. I’m going to try making a dressing tho….great idea! Hi Mandy, You go girl….get out that blender/food processor/shaker jar and make it happen. You’ll be spoiled though, your salad experience will never be the same. Take it easy on the don’ts though!!! Stick with the do’s . Hi Teddy, Tsk, tsk….ok, I guess naked can be beautiful, we are talking salad LOL….I agree though, veggies don’t need a lot of help to taste great but isn’t it nice to dress them up if they have somewhere to go??? Hi Nana, Wow, GREAT suggestions. I could eat spinach in a million different ways, too bad so many people are turned off by the overcooked or FROZEN kind, tres yuccccck…..